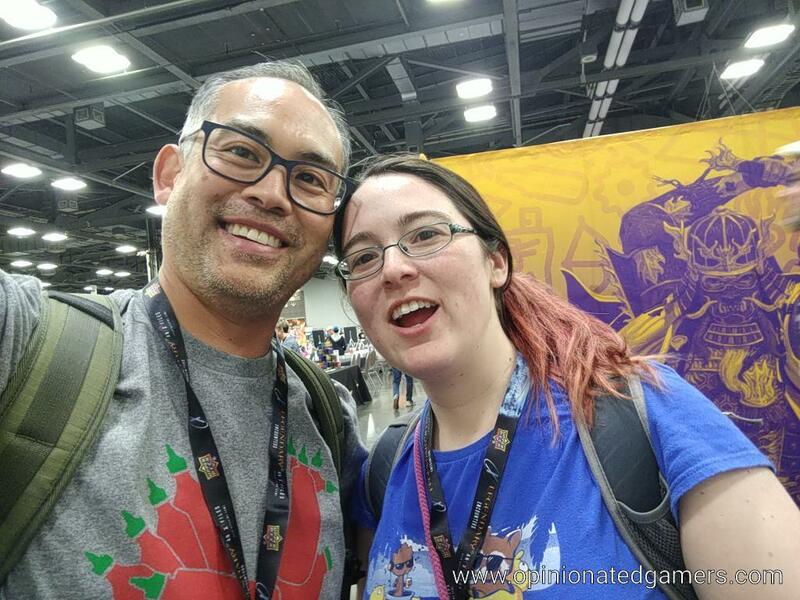 I feel that I am blessed to be so close to some of the major gaming conventions – the proximity allows me to get away, even if only for a few hours, to check out the sights and sounds of the newest games. Normally, I try to get one or two days free to see the show, but this summer has proven to be spectacularly busy with some unexpected kids’ soccer success (which keeps us in season still!) as well as a planned move to a new house later this summer. The result of all this is that I pretty much have no extra time to take off work, so I ended up having to squeeze in Origins in about half a day. 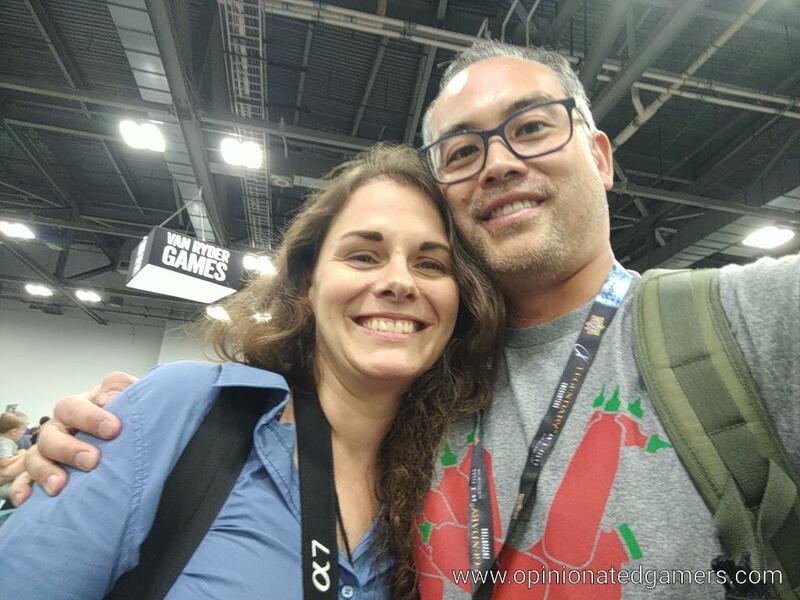 I know that in years past, I had claimed that it felt like Origins was dying… but when taking last year’s show in combination with this year, I must say that things are turning around for the better. 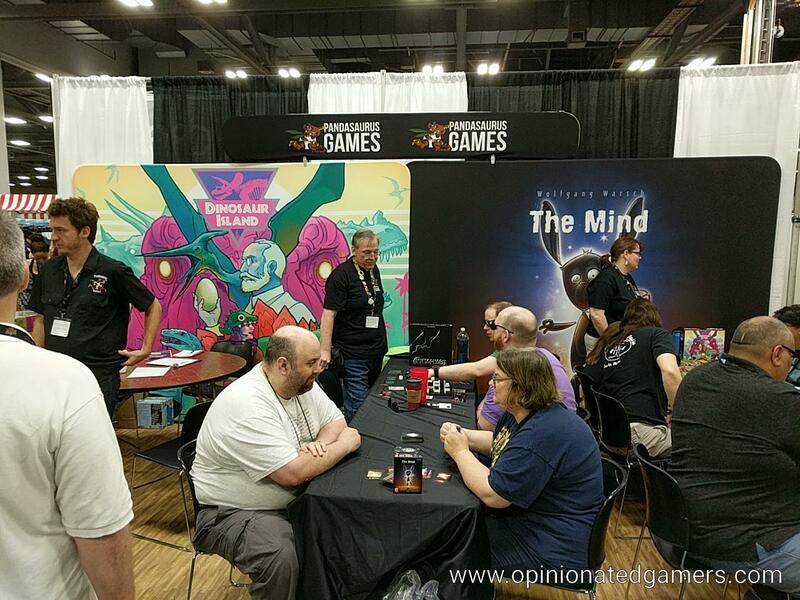 The dealer and sponsor halls were filled with more booths, and there was a sense of excitement about the event which may have been missing in previous years. There were a number of new releases to be found at the show, and there were more than a few companies which were making their Origins debut this year in Columbus, and that’s another good sign of positive growth. 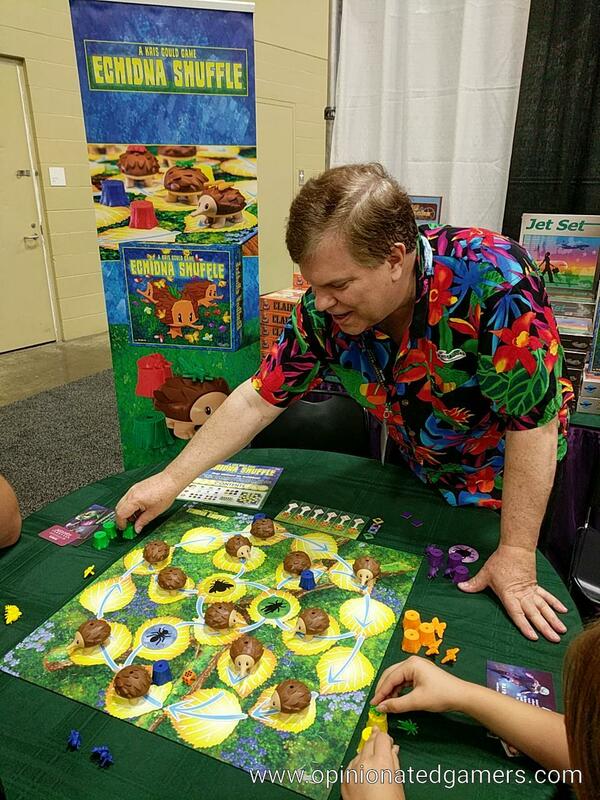 For me, most notable was Chip Theory Games, which has finally decided on a physical presence at convention. 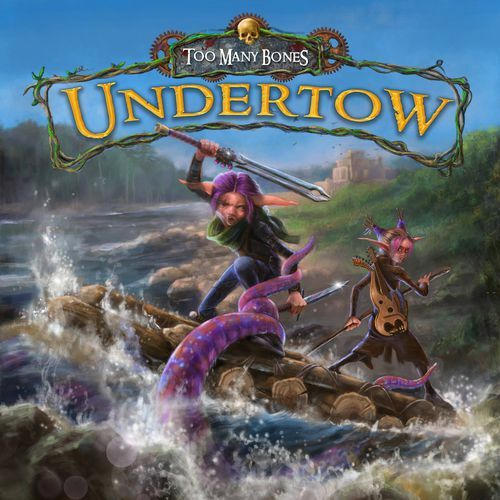 This was kind of a feeler event for them to see how the cons go – but they also plan to be at GenCon to herald the release of their new expansion for Too Many Bones – Undertow. 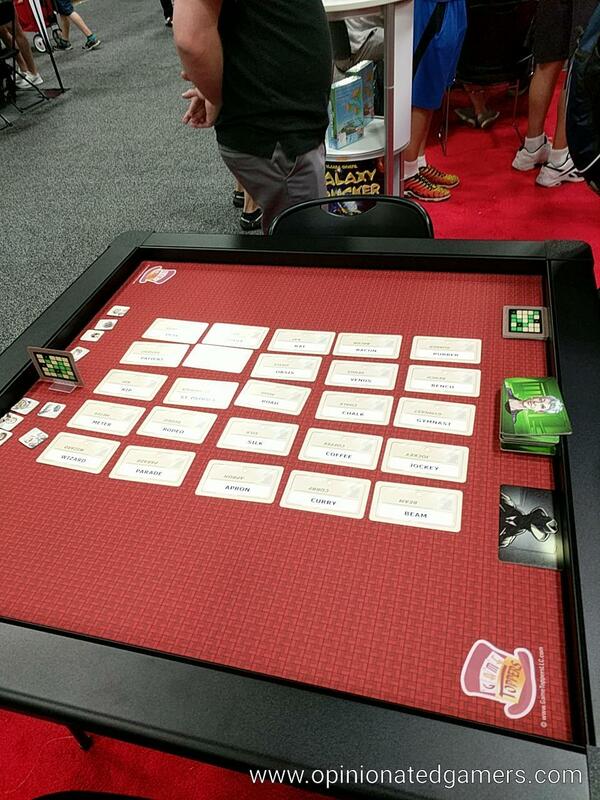 This game will be a 1-2 player standalone version of the game that ALSO will integrate with the base set. It is meant to be both an expansion for existing players as well as a lower cost introductory version for new players. I can’t wait to try the expansion… but I was swayed enough by the demo I got to get a copy of the base version to play as well! The logistics of the event are still smooth as ever. There were well marked signs all over the convention center, and while there were lines; all of them appeared to be moving quickly. I was able to get to Columbus a bit early, and picked up my press pass around 9:15AM, and was in the dealer hall by 9:20. This year, the dealer hall is in Exhibit Hall B, flanked on each side by a Sponsor Room (in Halls A and C). The dealer hall is open from 10am until 6pm, while each Sponsor Room has extended hours – I think from 9am until 11pm. During the day, this allows for a nice distribution of selling/demo stands and playing areas, though there were some reports that it was a bit less awesome at night as gamers had to take a 3 minute walk through the main concourse to switch between the two different sponsor areas. More than a number of folks ntoed that they would have preferred a larger single sponsor area to keep everything in one place at night. At the Plan B stand, I spied a small but prominently displayed stack of Coimbra. 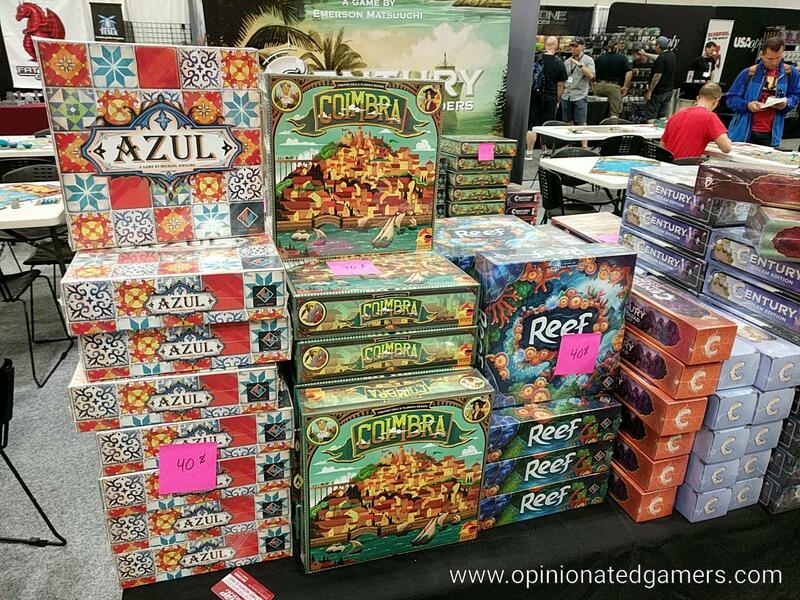 Plan B has a soft release of their new games: Coimbra, Reef and Eastern Wonders. 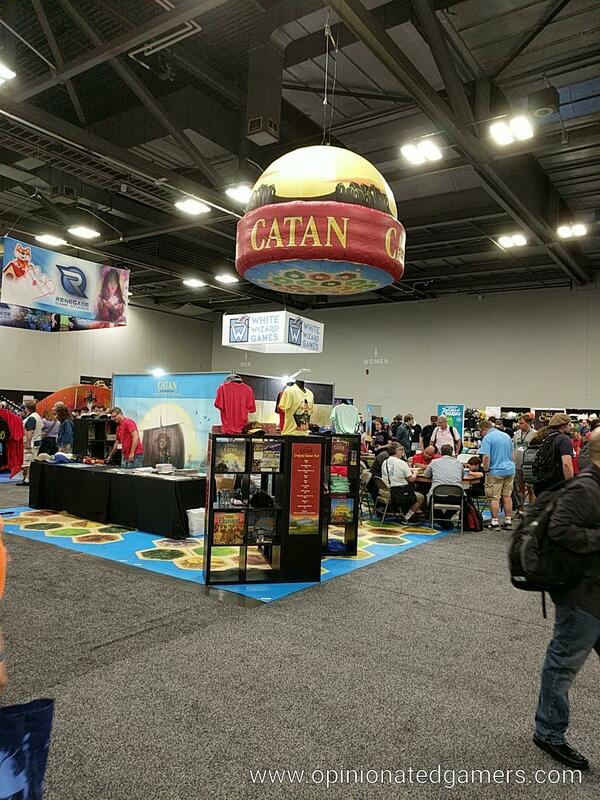 By the time I made it back to the stand around 10:30, it was completely encased in a line of buyers for the new games, and I heard that Coimbra was out by about 11AM. 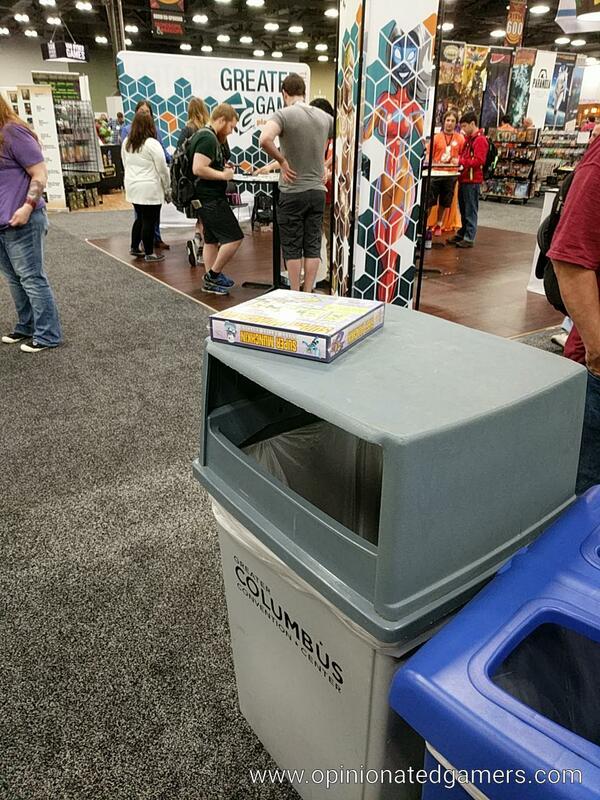 Not sure if more copies were going to be available later in the weekend, but this strategy seemed to work well for the company last year when they were able to get the first copies of Century: Spice City out to gamers at Origins last year. Right around the corner was the Floodgate area. 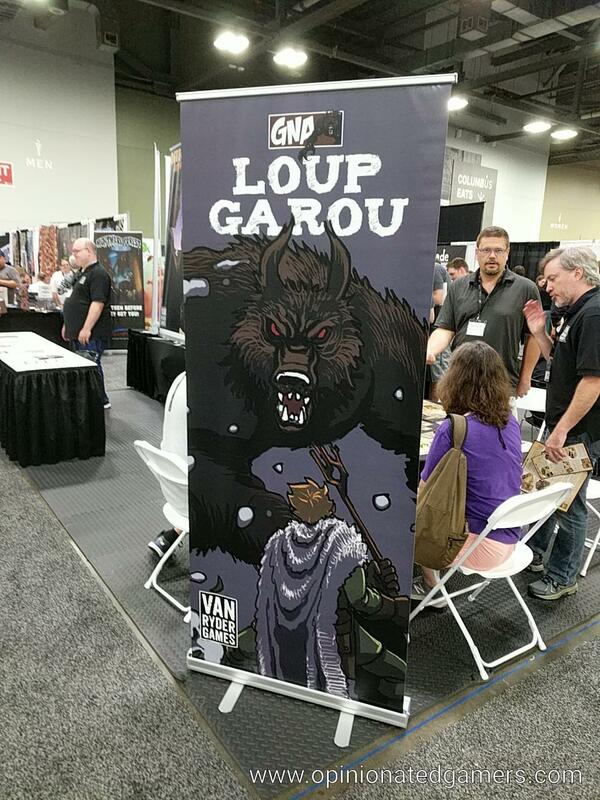 I think I caught them a bit early in setup, because it would be a bit generous to call it a booth. At the time, there were two folding tables in the space, at least covered with product! 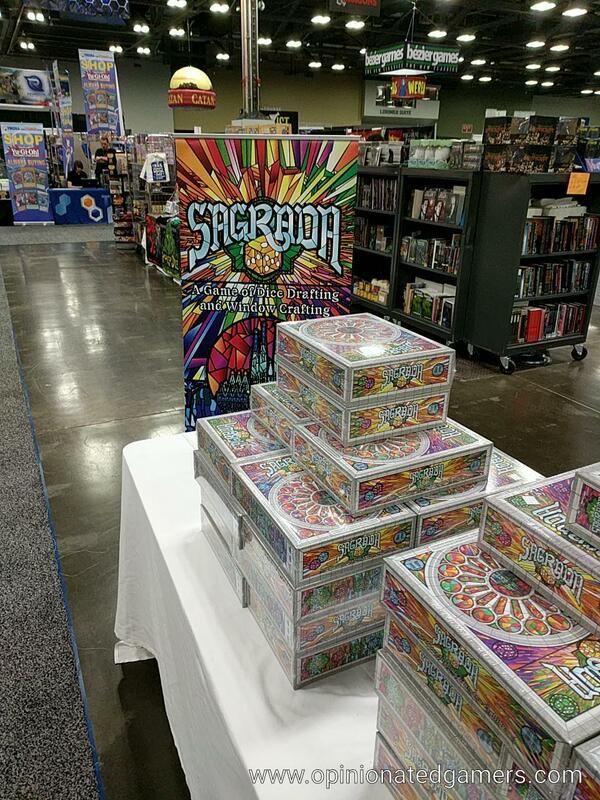 I was excited to hear that they are planning on a 5/6p expansion for Sagrada, and they also have plans to release a new game from Daryl Andrews (the same designer as Sagrada) called Bosk. It is described as: “During the spring in Bosk, players take turns carefully planting trees of various sizes to gain influence in the grove that will determine the points that are scored in summer. When autumn comes, the trees’ leaves fall in the rotating direction of the wind to cover the ground. Points are scored in the winter for the player with the most leaves in each region in the grove.” Can’t wait to try this, and it might make for an awesome themed game night with Photosynthesis and Arboretum? This card game has you fighting against other cryptozoologists to try to be the first to prove the existence of Bigfoot or the Yeti. I didn’t get a chance to play it, but I hope to give it a try soon. 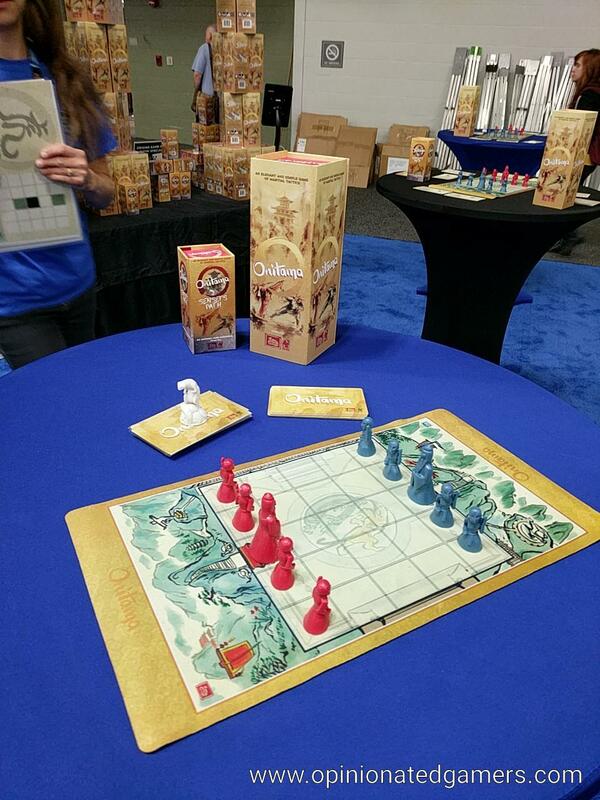 Onitama is getting a reboot from Arcane Wonders. I thought the minis looked nice in this version. Sadly, there is almost zero chance that a two-player only, perfect information game gets any play in my house, so this picture is the closest I got to the game. 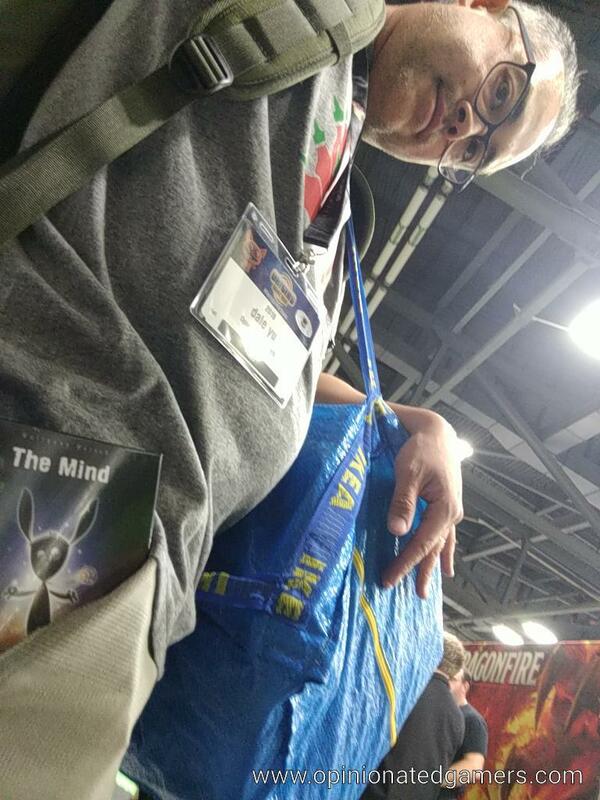 And, just to be like all the other cool kids, I kept my copy of the game in my pocket – just so I could ask random passers-by if they wanted to try the game. Sadly, I got no takers. And both Stephanie H. and Jessica D. proved to me that they each carried a copy of their person at all times! In the game, players move the twelve echidnas from leaf to leaf, picking up bugs in their color from their pick-up leaf, and moving them to the three matching-colored stumps. But the forest floor is a traffic jam of echidnas that have to be moved out of the way before you can get there. The first player to deliver all three bugs wins. 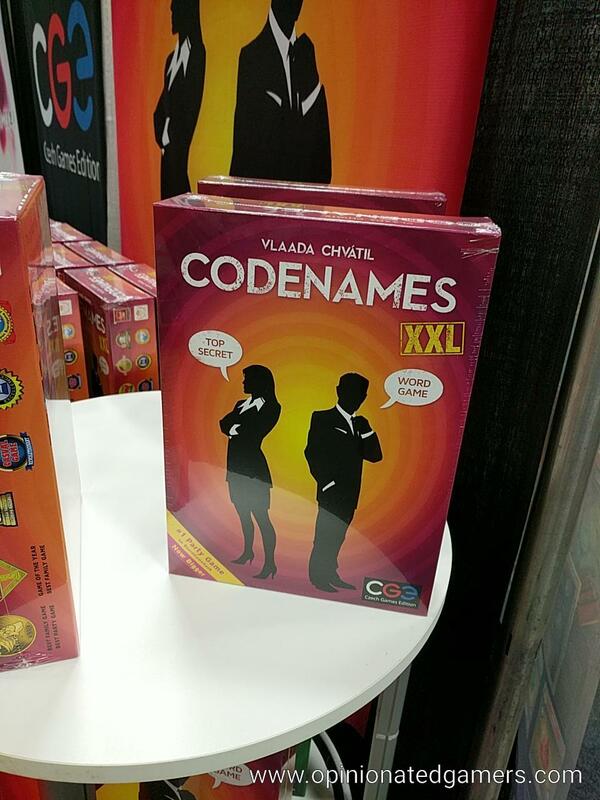 Apparently demand has been quite high for this enlarged version, and the company has already ordered reprints! While normally I’m all for keeping games as small as possible, I can definitely see where having larger cards (and therefore larger fonts) can be an advantage in a game where everyone needs to be able to read the words on the cards! 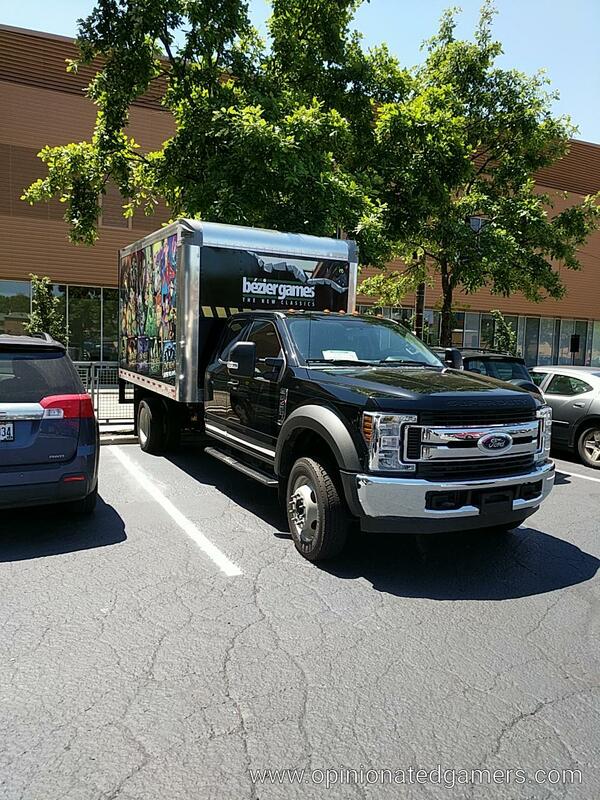 While outside, I also managed to find the new swanky Bezier truck which is being used to transport everything around the country to the various conventions. 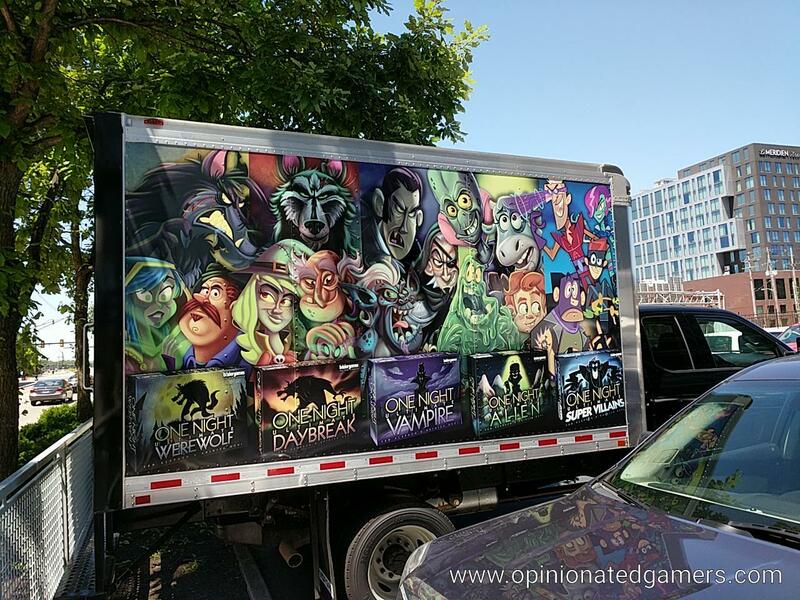 It’s pretty hard to miss, and I must say, the truck artwork rocks. One of the other booths which had a constant line was the Van Ryder booth. Their big release at the show were the “choose your own adventure” series of books – this has recently funded on Kickstarter, and individual copies were available for purchase at the show. Not sure what this means, but I thought it was interesting to report… Around 10:30, I noticed that there was a shrink wrapped game sitting on top of a garbage can… It was unclear whether someone had just left it there or what. Just before leaving at 3pm, the game was still there… Maybe someone can triangulate the location of this garbage can based on the stands in the background and see if the game is still there! 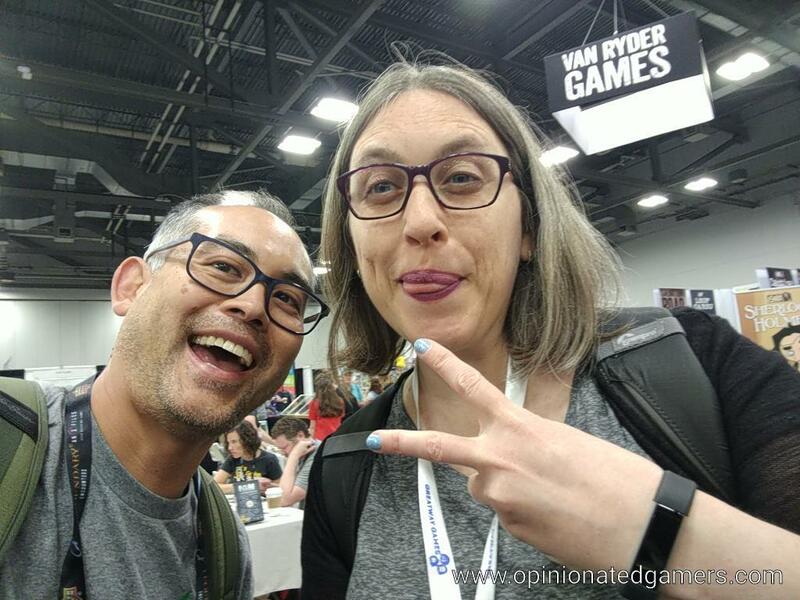 I did do a short stint of volunteering at the BGG stand (though I had forgotten my BGG jersey, so most people just looked at me like “who the h*ll are you? 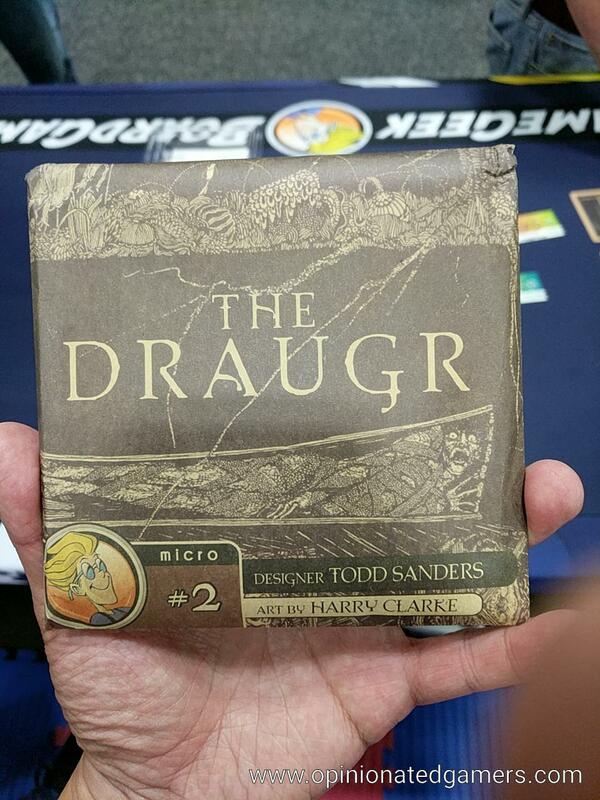 !”) – and while I was there, I did get a try of the new solo game in the BGG Micro series. The game was finished just in time for the show, and it looks to be quite a challenging solo affair. From the website: “The Draugr, reanimated dead imbued with magical powers, have come to the region of Trøndelag seeking to corrupt the town of Stjørdal. Only you, a lone revenant hunter, can protect the town and slay they who walk again. Armed with limited supply of holy water and iron spikes you enter the town square and prepare for the coming onslaught. 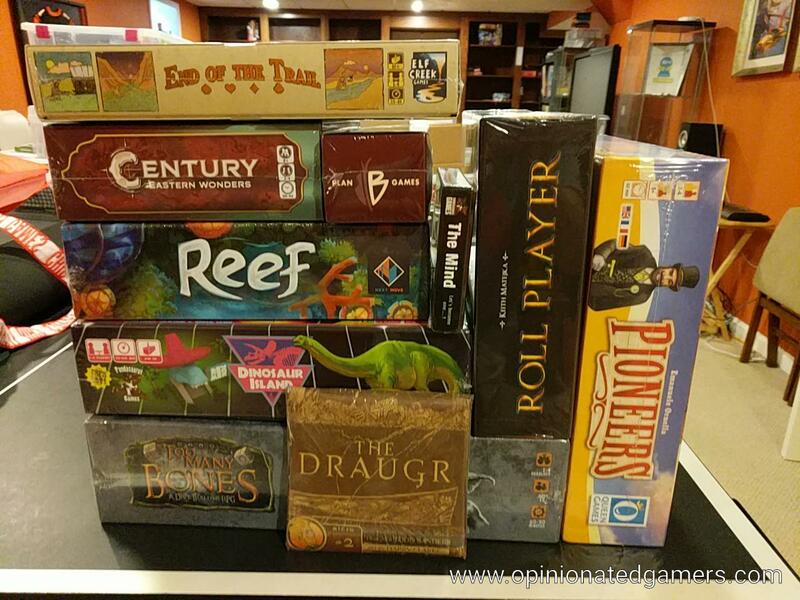 While you’re at the stand voting for the Geekbuzz, be sure to look at this new game; supplies may not make it through the end of the show – so do it soon! 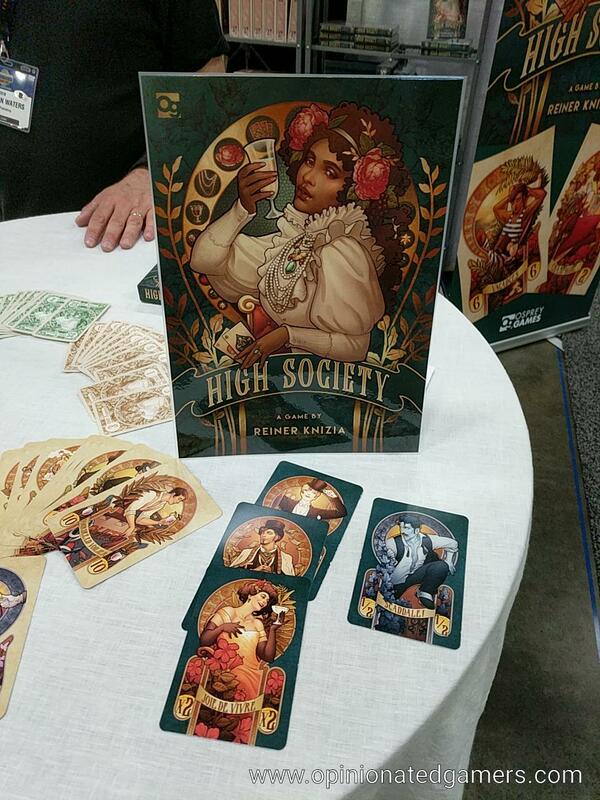 The last game I looked at – literally on the way out the door – was the re-skin of the classic Knizia game High Society. 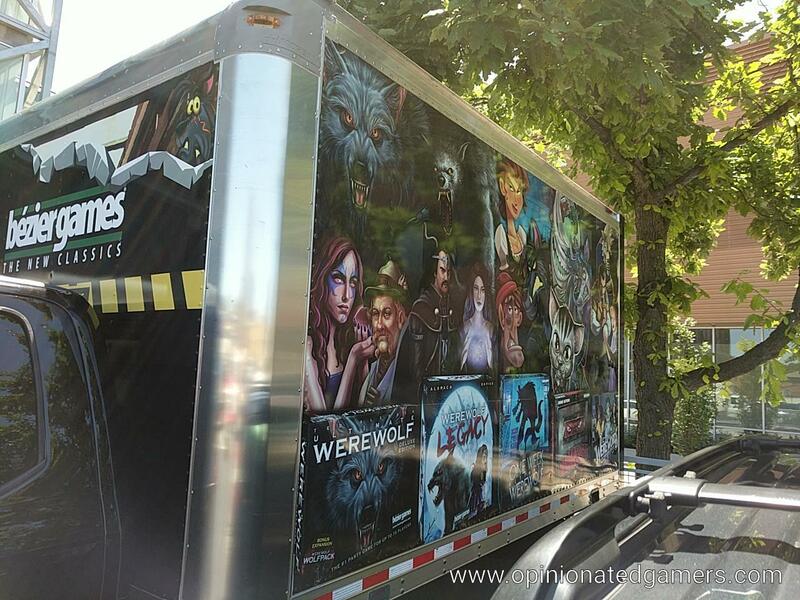 The new version is being done by Osprey Games, a company which is making continual strides into the Euro-game market. Before I leave, I should try to post my obligatory selfies with the gaming celebrities that I had a chance to chat with. I’m honestly not sure when I’m going to have enough time to play the new games given the hectic schedule… (and the fact I’m packing every night right now!) 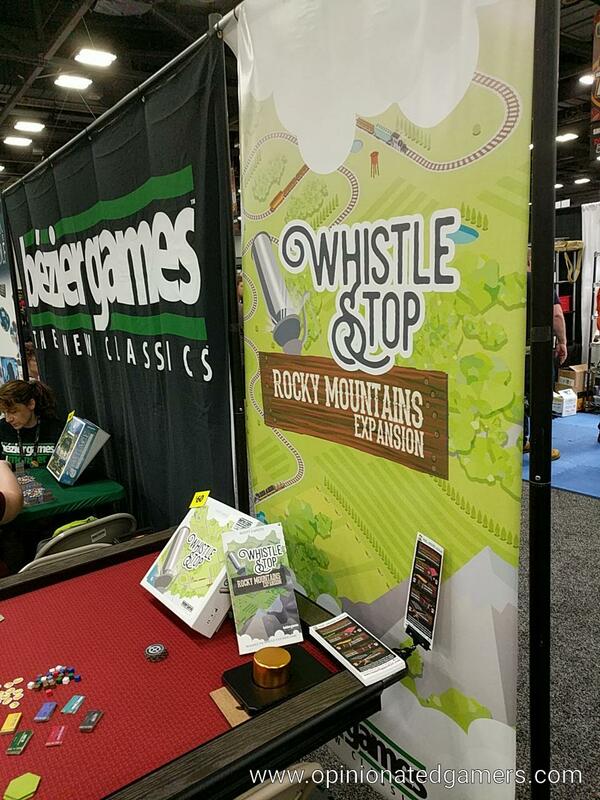 – but at some point, the games will hit the table, and I’m sure you’ll read about it here soon enough. 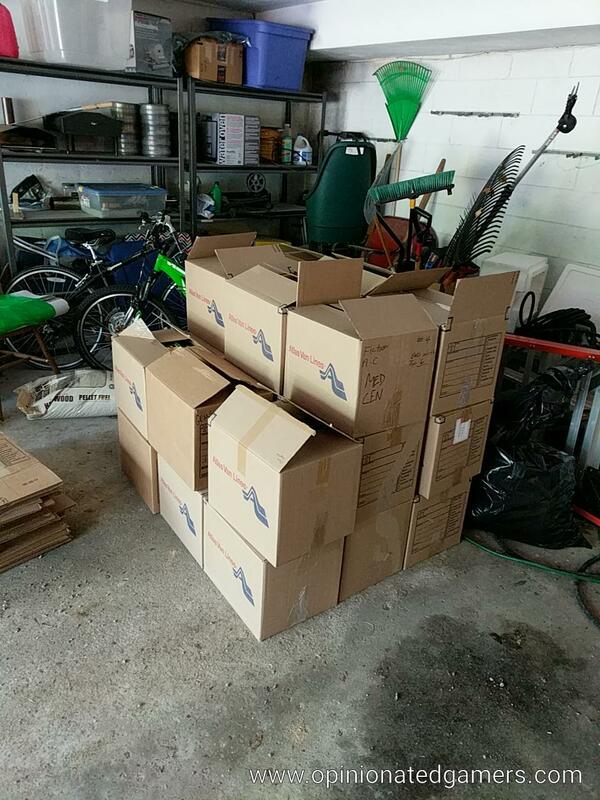 Here is the start of my burgeoning game box collection in the garage. As of this morning, I’m at 130 cubic feet and counting of game boxes! We’ll see if I get a chance to get back on Sunday to explore some more – but in case I don’t – i wanted to get this posted while it was fresh in my memory. If you’re anywhere around the Columbus Ohio area, head down to the Convention Center and check it out for yourself! 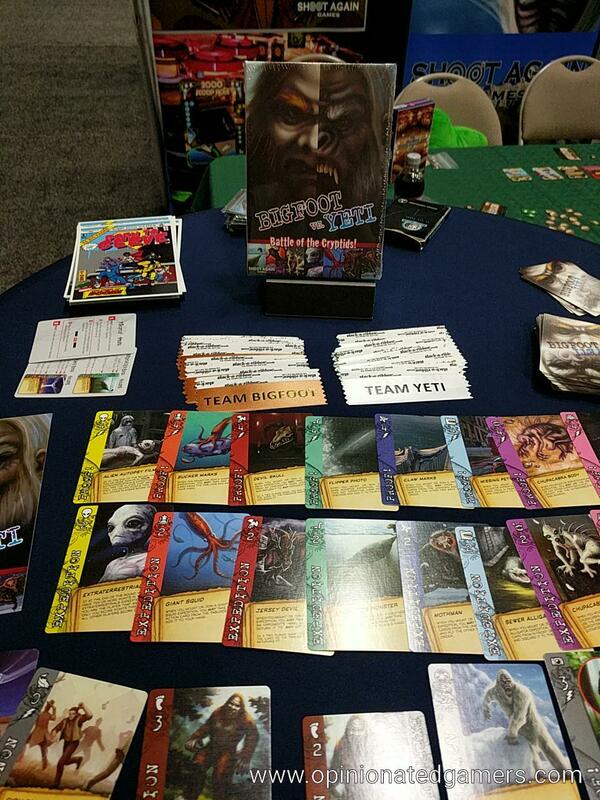 Dale, It was great seeing you at Origins and thanks for the Bigfoot vs. Yeti mention. Have a safe move. Hey Dale, It was a pleasure to meet you! The whole Chip Theory Games crew says hi! !